This was supposed to be a joyous occasion. Everyone showed up to a party to have a good time. We got eight different decks in the top eight, and it was one of the most stacked Pro Tours we’ve ever had. (With a finals between two of the three least qualified, but oh well.) We got to watch a vibrant Standard unfold before us, played by some of the best in the game. And yet, my Twitter timeline is full of players talking about boycotting Wizards and quitting Magic. What the hell happened? Some time in the wee hours of Sunday morning, Helene Bergeot got on camera to make a few announcements. (I think; I was sleeping.) The tl;dr is that HOF players can now only receive a maximum of $1,500 a year for playing on the Pro Tour, as opposed to $7,500 in years past. (They only get the $1,500 for showing up to exactly one Pro Tour, the one with the HOF induction, rather than all four PTs and the World Championships.) Platinum pros will now only receive $250 for showing up at a Pro Tour or the World Champs, rather than the $3,000 and $1,000 they used to pay out, respectively. Assuming both my interpretation of the announcement and math is correct, which is admittedly a leap, that amounts to a $6,000 pay cut for Hall of Famers, and a $11,750 pay cut for Platinum pros. Even more of a kick in the teeth is that that’s effective immediately following Pro Tour: Eldritch Moon. This means that since June of last year, players have been working to earn platinum for the coming 2016-2017 season. Now, as they’re finally crossing that threshold, the rug is being pulled out from under them. All those GPs and PTs you ground out over the last year to earn that cushy $12,000 next year as a plat? Gone. Suckers. Matt Sperling wrote up a great piece on the changes Monday morning and is absolutely worth a read. There’s also Jon Finkel’s, and The Ferret’s. These guys, along with many others, are much more qualified to talk at length about this, so I won’t add too much. I’ll toss in my quick thoughts, and then we’ll hit the other announcement to come out of this weekend. EDIT: On Tuesday afternoon (while this article was in the pipe to be published) Wizards announced that they’re retracting the Platinum benefits change, at least for the upcoming season. All the other changes will remain in place. 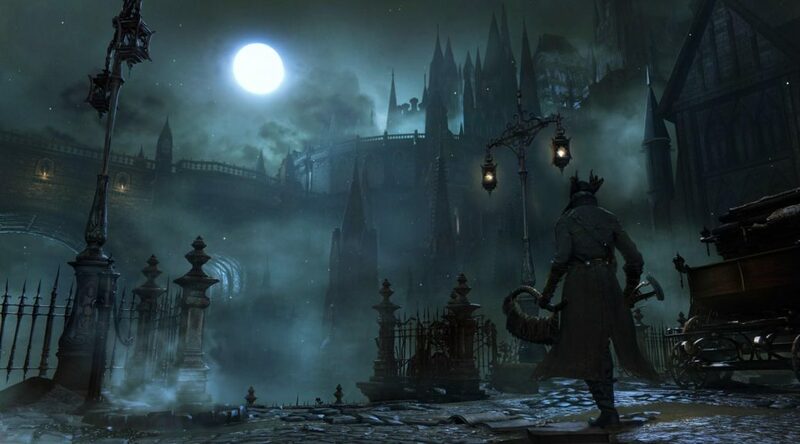 They’ll also be seeking feedback ahead of Pro Tour: Eldritch Moon in August from pro players, and I expect that we’ll get a new announcement regarding platinum changes at that time. This is a positive change for platinum players, but make no mistake, this is only delaying the inevitable unless in the next two months Wizards decides to completely change course. Unlikely. 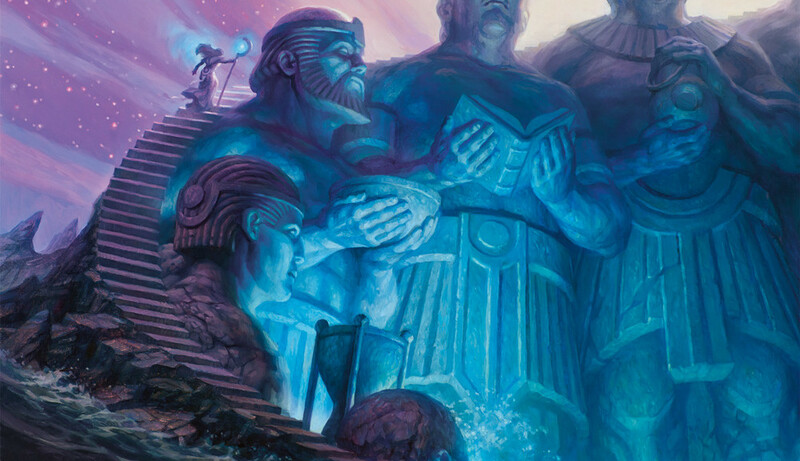 Everyone knew part of Eldrazi was going; it was simply a matter of Eye of Ugin or Eldrazi Temple. Frankly I’m surprised they chose Eye. I think it’s the less consistent card and comes with greater drawbacks relative to Temple, a land which carries no penalty aside from making only colorless mana. You can’t turn-two Thought-Knot Seers with Eye, but you sure can with Temple! Whatever. What’s done is done. Wizards has typically held changes to Modern’s ban list until just before the Pro Tour, in order to give the top level pros a new format to take a crack at. We all get to watch exciting new decks, and pros have the ability to leverage their deck building and format exploration skills. However, seeing two unbans at this point in the year, and alongside a major ban to boot, may mean that we’re not getting another Modern Pro Tour. 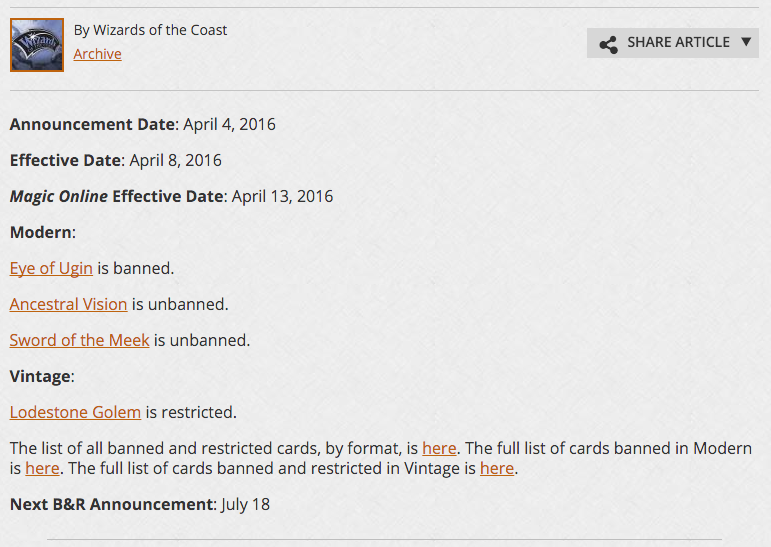 Without a Pro Tour to hold changes for, there’s no reason not to fire of the unbans as soon as they’re appropriate. 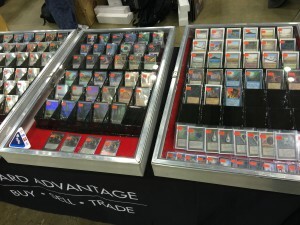 While there was a tremendous outcry at the removal of the Modern Pro Tour initially, that was before they announced the change to the block structure. Now that we know about that change, many of us have walked back our comments about needing a non-Standard Tour. Wizards has listened in the past, and they may have again. Ok, back on track. Eldrazi gone, Visions and Sword here. Let’s do the Eldrazi real quick. “Oh come ooooooooon,” I groaned exasperatedly. Mike had finally drawn into his Hornet Queen, and with that, the path of the game was now firmly headed in one direction. Hornet Queen would act as a stupendous rattlesnake, preventing anyone from attacking Mike. Eventually it would get cloned. Then it would die, and someone would reanimate it. And then it would die. And brought back with Puppeteer Clique. And so on and so on, until the world was nought but fire, brimstone, and bees. Even drawing an exile effect was dead, as Mike had a sac outlet on the board. 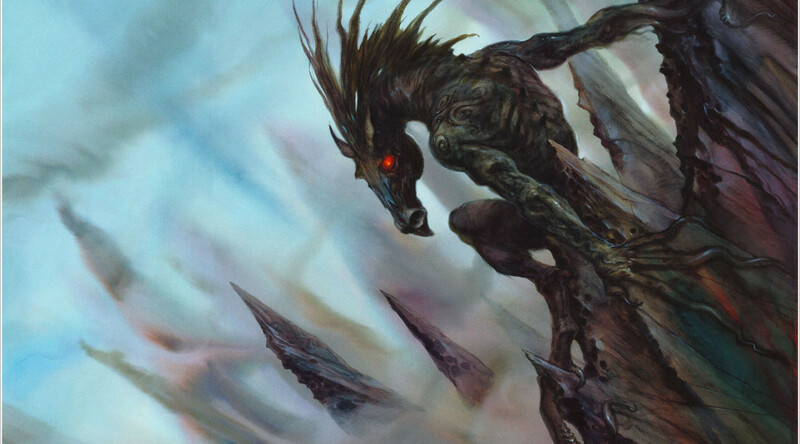 EDH is at its best when it offers fresh, evolving play experiences. That’s the whole point, right? To play cool and weird cards that you don’t see elsewhere. Points one and two lead to a direct reduction in novel gameplay. Reanimating or cloning Hornet Queen (or any creature) eight times isn’t fun or interesting Magic. Casting it once is fine, sure. But over and over? It invalidates so many other creatures, so many other cards, and so many attack steps. It’s not always Hornet Queen, of course, just whatever the biggest and baddest threat on the table is. “Just run exile effects!” Those get rid of whatever the most obnoxious thing is at the time, but it will simply be replaced almost immediately with something else. There’s always a tallest building. Similarly, tutoring reduces variety because you just end up getting the same few cards over and over. You’re either tutoring for a wrath, the same two or three creatures, or some giant game-warping permanent. Instead of playing what you draw — essentially playing your whole 99 cards — you play with what you tutor for. Suddenly you’re only casting maybe 30% of the cards in your deck, because you tutor for the same ones each and every game. Unlimited hand size is unhealthy for two reasons. Not only does the unhindered player’s turns take an excessive amount of time because they have to decide which of their 28 cards they want to cast that turn, but because the dynamic of the game changes. Instead of several players battling for position, it becomes all-against-one, with a slow slog through one gigantic hand’s worth of resources. That player is going to hit their land drops every turn and keep presenting major threats as everyone else tries to stop them. Eventually the other three at the table will run dry on resources after answering the first 27 cards, and it’s the 28th that wins the game. It’s a tedious process that elicits a lot of head-desk reactions. Ok, enough of my EDH soapbox. I told Mike he needed a new EDH deck, to which his response was that he agreed, and wanted to build one, but he wasn’t interested in trying to buy all the odds and ends needed to get it together. It can be a time consuming and expensive process. I commented that I’ve been successful finishing EDH decks using PucaTrade, and Mike was into it. In fact, there’s a collection of specific goals that PucaTrade is excellent for. Last week I wrote about the state of Puca’s market, reasonable expectations for users, and the dynamic of exchange rates. This week I’m going to put some of that into concrete use scenarios that will help you maximize the utility of the product.